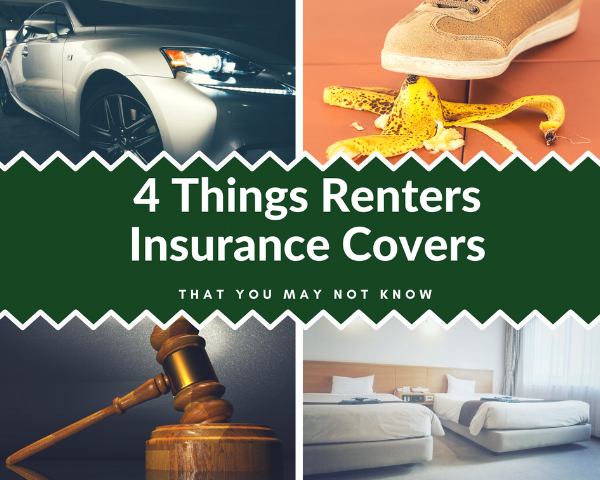 Renters insurance covers so much more than just the house, apartment or condo you rent. Your renter’s policy can also cover your personal belongings if they are stolen or damaged at your rental unit, or even at someone else’s unit. 1. Renters insurance covers personal belongings within your house as well as personal belongings you keep in your car or storage unit. Renters insurance can cover any of your personal belongings that are stolen or damaged in the house, apartment, condo or dorm you rent as well as personal belongings that may be damaged or stolen from your car, or even a storage unit you use to keep your belongings. Coverage includes fire, lightning, theft and vandalism. 2. Renters insurance can cover medical payments if someone was injured on the property you are renting. Your friend falls and cuts his ankle because you forgot to put some salt on the sidewalk after it snowed and expects you to cover the medical expenses – your renters insurance policy will cover that! Note that medical payments coverage is meant for small claims. Medical payments would cover the medical costs as long as the costs don't exceed the limit, typically $1,000 or $5,000. 3. If someone sues you for damaging their property, your renters insurance policy can cover lawyer fees and court costs. Through your renters policy, you can have personal liability coverage which means your lawyer fees and court costs would be covered if you were sued for damaging the property of someone else or an injury on your property that exceeds a small claim. One common injury that falls under personal liability coverage is a dog bite. It’s estimated that dog bites account for nearly one-third of home insurance liability claims. If you’re a dog owner, don’t assume this situation would never occur or rely on your landlord’s insurance to cover injuries. 4. Your renters insurance policy can cover hotel and food expenses if the home or apartment you rent is damaged by fire or tornado. Your apartment is damaged by a fire from the next door neighbor and it’s determined for health and safety reasons you can’t stay there. In addition to replacing your damaged belongings, renters insurance can cover your hotel and food expenses while your place is getting fixed. Don’t assume your personal property or expenses would be protected by your landlord’s insurance. Making this mistake could leave you at risk of losing your personal belongings and being on the hook for any related bills while your rental unit is uninhabitable. Questions about what a renters insurance policy covers? Contact Wallace & Turner today to learn more.